The experience of walking into a gym and feeling completely daunted has happened to most of us. You might have overheard other gym goers talking about their favourite equipment or how much they can bench. The gym can be an intimidating place if you’re not familiar with it. Exercises intended to improve muscle strength and power come in many different forms. 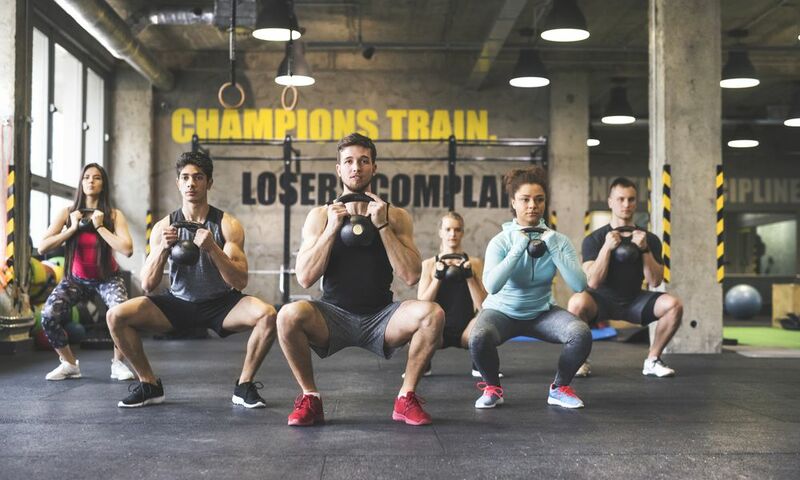 This blog post is adapted from Strength Training, 2nd Edition and explains the different types of strength and power training that can be used. In the past, isometric training was the most common form of strength training. However, over time gym goers have shifted their focus to more functional types of strength and power training. Nonetheless, it is still an effective training method for gaining strength. Isometric exercise is a form of strength training in which the joint angle and muscle length don’t change during contraction. These exercises usually involve a pushing and pulling action. An example of this is pushing a fixed object such as a wall, bar or weight machine attached to the floor (figure 6.1). Or holding a weight in position with the muscle contracted, such as holding a dumbbell in place with your arm slightly bent (figure 6.1). To perform isometric exercises you don’t need to own free weights or a machine. All you need is a fixed or stationary object that you’re able to push or pull against. These exercises are usually held for about six to eight seconds. These decreases in athletic performance and muscle endurance can make isometric training one of the least appealing types of strength and power training. These exercises are mainly used in rehabilitation and physiotherapy. Isometric exercises should be only be used as part of a larger strength training programme. Have you ever wanted to dunk like LeBron James? Or run as fast as Usain Bolt? If the answer’s yes, then you might want to add plyometric training to your programme. Most athletes already use some form of plyometric exercise to improve the agility, speed and power necessary for explosive movements. To better describe how plyometrics work, consider the example of a two-leg standing long jump. Focusing mainly on the quadriceps. Before take off, the long jumper dips down a bit. This forces the quads to eccentrically contract and stretch. Soon after, the quads concentrically contract. This causes the leg to straighten out and spring off the ground. Plyometrics focus on training the period of time between the eccentric and concentric phases. Plyometric exercises are usually performed in athletic strength and conditioning, but are becoming increasingly popular in gyms. Luckily, a variety of plyometric exercises can be performed with equipment that’s easy to find, including wooden boxes, crates or weighted balls. One of the most popular exercises is the depth jump. As discussed in How shock plyometrics can make you more explosive. Like all types of strength and power training, this form has many benefits. These include increased muscle and bone strength and improvements in functional power and performance. This is one of many reasons plyometrics are mainly used in athletic strength and conditioning. Athletes learn to use the maximum power their bodies generate on the court, track or pitch. However, like other forms of training there are a few limitations. Due to the intensive nature of plyometrics, you shouldn’t perform these exercises without a proper foundation of strength. You should build up your routine training programme and develop a foundation for strength before adding plyometrics. Strength ball training (or medicine ball training) is useful for professional athletes, weekend warriors or older adults wanting to improve their strength. This type of strength training can be easily adapted to meet a variety of needs and goals. Strength balls come in various sizes and weights. How and when these exercises are used can vary greatly depending on your goals and abilities. Also, strength balls’ texture and composition mean they can be easily handled and used for a variety of exercises. For example, they can be thrown up in the air or against the wall and caught with relative ease. A lot of basketball players and boxers use this type of exercise to develop the ability to quickly pass the ball or throw a punch. Additionally, strength balls can be used to build core strength and stability. It’s important to be aware that using strength balls in your training programmes has some disadvantages. Firstly, most gyms don’t have enough space to allow members to safely throw them against or a wall or in the air. This limits the number and type of exercises that can be performed. Secondly, strength balls raise safety concerns similar to those of isometrics. To minimise the risk of injury when using strength balls you must be sure you have adequate strength to be taking part in power exercises. Plus, you need to be using the correct form and technique when performing the exercises, as with all types of strength and power training. Learn more about form in Strength Ball Training, 3rd Edition. The use of kettlebells has grown in popularity over the years. Kettlebell training has advantages when it comes to swinging movements and stability work. This is due to the fact the weight is below the handle, instead of on the outside like on a dumbbell. There are two different forms of kettlebell: the cast-iron classic kettlebells and competition kettlebells. They typically range from 8kg (18lb) up 48kg (106lb). Kettlebells become very popular in home gyms and smaller gyms and athletic facilities as they’re portable and don’t take up much space. One of the most popular uses is the kettlebell swing. The kettlebell’s lower centre of mass increases the distance of the weight from the body. This increases the work done by the posterior chain more than if the work was performed with a dumbbell. (see figure 6.9). Use of kettlebells is also popular in core and stability work. Holding a kettlebell in one arm while performing a lunge forces you to keep your core tighter in order to keep the spine vertical. Additionally, holding the kettlebell above the head can make the movement more difficult while adding stabilising demands on the shoulder joint. The use of proper technique is critical if you’re looking to develop stabilisation. Beginners should use lighter weights to begin with. Suspension training systems (STSs) like TRX® have become more popular. This is due to their versatility, simplicity and ease of use. Although multiple types and brands are available on the market, suspension training simply requires some sort of rope or strap suspended from something solid enough to hold your body weight. The main draw of suspension training is the fact you can use your body weight in multiple angles and positions. This allows you to change the difficulty of exercises. An example is using suspension training for press ups. If you were to stand fairly vertical, there would be little resistance. However, if you moved your feet back and lowered the angle of your body, the intensity of the movement would increase. (figure 6.10). This makes suspension training a great tool for people who don’t possess the strength to do a normal press up. Although suspension training is great for beginners or those without free weights, strength gains can be limited. The lack of ability to add resistance beyond body weight is likely to cause strength gains to stagnate. However, an experienced lifter who uses only free weights and machines can benefit from the stabilising requirements of suspension training. As with all equipment, safety and proper technique are very important. As STSs suspend your body weight, the placement and anchoring of the device is important. Make sure it’s suspended from a sturdy surface that’s strong enough to support more than your weight. It should be secured in a spot that provides little room for the STS to slide. Avoid securing the STS to structures that are top heavy. For more exercises, check out our blog TRX® Workout – Iso Squat or in The Complete Guide to TRX® Suspension Training®. The use of resistance bands in strength training is becoming increasingly popular. We recently wrote a post on using resistance bands in strength training, Resistance band exercises to strengthen your shoulders and back. As detailed in the post, the use of resistance bands is simple. As you stretch the band, the resistance increases. This allows the muscle to build strength and helps increase muscle mass. Strength training with resistance bands allows you to do the same exercises you’d usually perform on expensive gym equipment. You simply change the level of resistance, number of repetitions and speed of exercise to meet your fitness goals. Their portability allows you train whenever and wherever you are. Resistance bands are an effective complement or alternative to any strength and power training workout. They’re especially popular among experienced lifters for targeting the lock-out of lifts such as the squat or bench press. Attaching resistance bands to the end of bars and anchoring them to the floor or bottom of the rack adds resistance at the top of the lift. This allows the lifter to have overload on certain lifts and have a stronger lock-out. Despite the benefits of using resistance bands in strength training, there are a few downsides. As the resistance is greater the more the bands are stretched, you’ll only get minimal resistance at the start of the movement. This can result in less strength and power gains at the early angles. Because of this, users might experience uneven gains in muscle strength and power. Strength Training, 2nd Edition features more types of strength and power training. Some form of progressive resistance training is needed to maintain muscle strength and health. However, as noted such training also strengthens bones, tendons and ligaments. Plus, resistance training has also been shown to increase overall feelings of energy. Having the right strength and power to perform everyday activities is essential to a person’s well-being and independence. It’s also very useful if you’re competing in athletic events, either recreationally or professionally. Luckily, there are types of strength and power training to fit most people’s needs. All it takes to begin any strength or power training programme is understanding of what your goals ares. Plus, the exercise you can do to achieve these goals. Whatever your goals, there’ll be a type of strength training for you!